So why do we get overweight? Why do we overeat? The reason we overeat is because of hormones. Your weight and the amount you eat are well regulated, just like everything else in the human body. And they’re regulated by hormones. You can begin by thinking about a child. A child overeats, and why does a child overeat? Because he’s secreting growth hormone. Why does a child secrete growth hormone? Because that’s a normal part of human development. They put on weight when they get taller because they secrete growth hormone and they’re growing. So why do adults overeat? We overeat because we’re secreting insulin. Why are we secreting insulin? We’re secreting insulin because of the refined carbohydrates in our diet. So overeating does not make you fat. Insulin makes you fat. And I’ll tell you, we’ll talk about overeating. This is what happens. We drew this diagram earlier. We said this is your fat tissue here, and then there’s glucose. The glucose comes from these carbohydrates that you eat, and it’s going through your bloodstream circulating, and then along comes your buddy, insulin, and he’s gonna help you out, he’s gonna keep you out of a coma by stopping that glucose from flowing through your blood and stuffing glucose in fat. All of the energy that’s flowing through your bloodstream, including your glucose and your fat cells – I mean your fat, there’s fat in your blood – the insulin says, “Put all that into the fat tissue, put it in the fat tissue, put it in the fat tissue, put it in the fat tissue.” And what happens at the end? Do you have a lot of energy to go to the gym? Do you have energy to play with your kids? Do you have energy to go on a walk after dinner? No. You want to sit on the couch. You want to sit on the couch because the insulin is robbing your bloodstream of your energy. What you feel here, is you feel like “I don’t have energy to do anything.” And this isn’t normal. God – or nature, whatever you believe, – God or nature wants you to have energy and wants you to feel great. He wants you to have enough energy to play with your kids and do what you want to do. You’re not intended to be a lethargic couch potato. Which goes to the exercise. This is your fat tissue. You’re not eating the carbs, you’re not making the insulin. All the energy is coming out of your fat tissue, plus you have energy from fat and protein in your diet – that’s in your blood system. Now you have energy to go to the gym; now you have energy to go on a walk; now you have energy to play with your kids. So the insulin, it doesn’t just make you fat but it robs you of your natural, normal energy. This is why people feel better when they eat this. If you don’t eat the carbs, and all you eat – don’t eat the killer carbs. Let me say something here, anytime I refer to carbs and I say, “Don’t eat the carbs,” I’m talking about these. I’m not talking about all carbohydrates. We’ll go over that a little bit later. But if you don’t eat the carbs and all you eat is fat and protein you feel wonderful. You have energy like a child, you have energy you thought you had lost. And you have that energy because it’s all coming out of your fat cells and it’s coming from your diet and there’s no insulin that’s blocking this up. 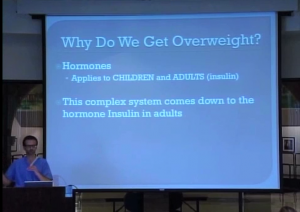 So insulin doesn’t just make you fat, it makes you lethargic. It makes you feel horrible. Insulin does something very valuable — it prevents you from going into a coma when you eat a high-carbohydrate meal. So that’s good. But the bad part is that it makes you feel bad and it robs you of energy. Traditionally, when they say, “Go on a diet. 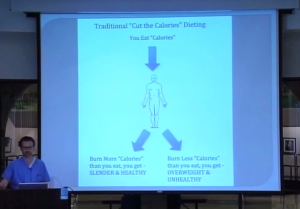 You go on a diet, you need to cut the calories. And when you cut the calories, you need to cut the calories that come in, or you need to burn more calories by going to the gym. And it’s very straightforward: there’s calories that come in, and if you burn more, you’re skinny and healthy and if you burn less, you’re overweight and you’re unhealthy. It’s a very simple concept, but it’s not true. How much weight you put on has nothing to do with how many calories you consume. And the reason is this, because the whole human metabolic system is so complex, there are all these different reactions. So every calorie, every bit of food that you put into your mouth goes through all these reactions, and that looks really complex, right? That’s what we were just looking at. See that little tiny thing? That’s what we were looking at. These are all the chemical reactions that happen in your body. So it’s not just, you put in calories and you burn more that the calories in, calories out, you put in more, you burn less. It’s all those metabolic reactions and then all the hormonal reactions. I call it “biological systems dieting” because you feed fuel into this whole biological system. It’s not just how many calories come in, how many calories go out — it’s not that simple. In Dr. Atkins’ book, he talks about this ketosis lipolysis. 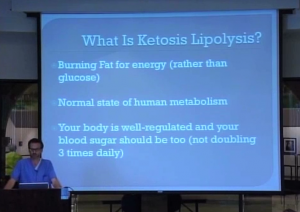 Ketosis lipolysis is simply your body’s burning fat for energy. And my contention is, is that this is the normal state of human metabolism. And that for 99% of humanity, people walked around in ketosis lipolysis all day long every single day. And it’s only in the last several decades that we’ve eaten so many carbohydrates that we’ve just made it to where we operate on blood glucose instead of operating on ketones and/or fat. And all those biological systems and hormones, they ought to keep your blood sugar just like this, all day long — flat, 90 — all day long. And if you eat those carbs, it doubles and doubles and doubles, three times a day. So which one’s more physiologic, which one’s normal: high carb, refined carb? Or meat, fat and vegetables?